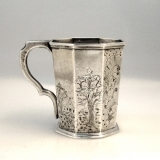 American octagonal coin silver childâ€²s cup with floral scroll architectural and scenic decorations c.1835. This wonderful cup measures 3" tall, 3 3/4" across the handle, 2 1/2" in diameter and weighs 95 grams or 3 ozs Troy. The excellent original condition save for a few dents, with no removals, repairs or alterations, make this an especially attractive offering. Monogrammed Abraham Quackenbush, the soft, warm, original finish is present, with no buffing or machine polishing.